How do I buy TaalMala? How much does TaalMala cost? Is it a one-time payment? What is the difference between various editions of TaalMala? What is the difference between Premium Edition and Premium (7 days) Edition of TaalMala on Android? I purchased TaalMala App in the past and I want to reinstall it on my new Android mobile/tablet. How can I do so? I purchased TaalMala App in the past on my iPad/iPhone/iPod and I want to reinstall it on my new iPad/iPhone/iPod. How can I do so? I purchased TaalMala App, but it's showing Trial Expired message or stopping after 5-minute playback. What do I do? I received license file for TaalMala App, but it's not getting detected. What do I do? I am getting an error when trying to pay using my debit card or Netbanking via Google Play Store. How can I purchase TaalMala? I already paid for TaalMala license for Android. How do I receive and install the license on my Android device? Can I install and use TaalMala on more than one computer? Can I install and use TaalMala on more than one tablet/phone I own? What are the minimum system requirements for running TaalMala on Windows PC/laptop/desktop? What are the minimum system requirements for running TaalMala on my Android phone/tablet? What are the minimum system requirements for running TaalMala on my iPhone/iPad/iPod touch? If I buy Basic or Classic Edition of TaalMala today, can I upgrade to Classic or Premium Edition later? I purchased a TaalMala license one one platform (Android/Windows/iOS) in the past and I want to transfer the license to another platform now. Is this possible? When will I receive my installation password/license key? Do you provide installation CDs for Windows Desktop version of TaalMala? Can you provide a substitute password/license key? I wish to cancel my order. What's the refund policy? Why does TaalMala Android Edition need so many permissions to run? Why doesn't the original license key work after changing computer? How do I get the pre-composed Taals for TaalMala? How do I contact TaalMala.com? How do I compose a Taal, Lehra or SwarMandal patterns using TaalMala? Will I be charged any fees when paying for TaalMala via Paypal? I have both Windows and Android versions of TaalMala. How do I play a Taal composed using my Windows version on my Android device? How do I use my own or custom Tanpura sounds with TaalMala (Android only)? Is TaalMala on iPhone/iPad available at a discounted price for customers in India? Play/Pause/Stop buttons in TaalMala (PC Edition) toolbar is/are grayed out. Why? Q. How do I buy a licensed Edition of TaalMala? How much does it cost? Is this a one-time payment? A. To license TaalMala on your mobile/PC, you need to pay the appropriate licensing fees. This is a one-time payment. There is no recurring/subscription cost. Note that the prices may vary from country to country, depending upon local taxes and provider fees. Windows Desktop Version: Please complete the purchase via our online secure payment gateway. Android Mobile/Tablet Version: To purchase Android version of TaalMala for your mobile/tablet, please use the upgrade button on the app's main screen (the button on top right corner which looks like a credit card). You can complete the payment directly via Google Play Store or via our web site's secure payment gateway. Google Play only accepts a limited number of credit cards. If you do not have a credit card or wish to purchase via Netbanking or debit card, or are having difficulties purchasing from Google Play Store, you can directly purchase from us via ouronline secure payment gateway. iPhone/iPad (iOS) Version: Please purchase via "Buy" button on the main app screen. Q. What is the difference between the various editions of TaalMala? A. Please refer to the TaalMala features page. Q. What is the difference between Premium Edition and Premium (7 days) Edition of TaalMala on Android? A. Functionality-wise, there is no difference. The Premium (7 days) Edition of TaalMala, which is currently only available on Android platforms, provides Premium Edition features of TaalMala for a limited period of 7 days. After 7 days, the license will be downgraded to Trial Edition. Q. I purchased TaalMala App in the past and I want to reinstall it on my new Android mobile/tablet. How can I do so? Q. I purchased TaalMala App in the past on my iPad/iPhone/iPod and I want to reinstall it on my new iPad/iPhone/iPod. How can I do so? Q. I purchased TaalMala App, but it's showing Trial Expired message or stopping after 5-minute playback. What do I do? A. For Android version, download and install the latest version of TaalMala from Google Play Store. Then go to Settings in the App and at the bottom, click on the license refresh button. This will refresh your license from Google (or from local file), as long as you are signed into the device with the same Google ID as used while purchasing the app originally.. If you still continue to get the trial message, please read instructions on this page carefully and follow the instructions. For iOS version, click on "Buy" button on the main screen of the app and then click on "Restore", while being connected to the Internet. This procedure will restore your previously purchased license on the device, as long as you are signed into the device with the same Apple ID as used while purchasing the app originally. Q. I received license file for TaalMala App, but it's not getting detected. What do I do? A. This FAQ is applicable only if you purchased a license to TaalMala on Android via our web site and not via Google Play Store. If you received the license file from our customer service, copied it to your device and are still having issues with the license detection, here are a few things you to try. Ensure you have carefully read and followed the instructions sent to you in the installation email for copying the license file. Watch this video. Ensure that the license file is named exactly as license.lic. Note the spelling of the word license. Many-a-times, while copying, the file gets renamed as license(1).lic or license1.lic or licence.lic etc. Any name other than license.lic will not get detected. Go to Settings, find the license refresh button (at the bottom of the screen) and click it while being connected to the internet. Wait for 2 minutes. 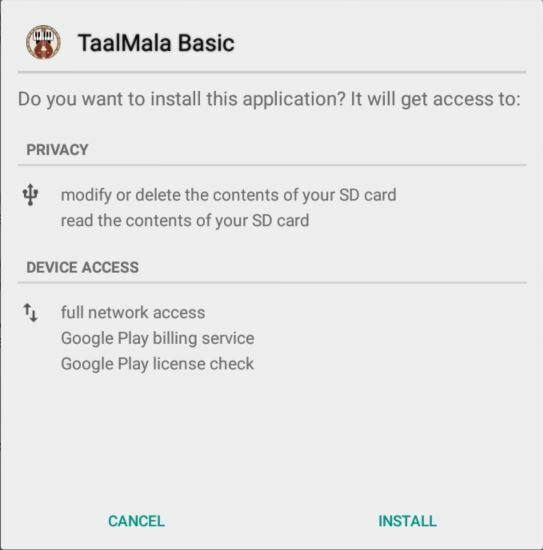 If none of the above things work, uninstall the app from device, delete the folder TaalMala from your SD card and then reinstall the app using the instructions sent to you. Send us a screenshot of your device folder TaalMala, with the file license.lic in it. Q. I am getting an error when trying to pay using my debit card or Netbanking via Google Play Store. How can I purchase TaalMala? A. Google Play Store does not accept debit cards issued by certain banks in India and India Netbanking payments. If your payment method is not accepted by Google Play Store, you will get an error. In this case, you can complete the payment via our web site by visiting the Buy Now page and pay securely using your credit/debit card or Netbanking account. Q. I already paid for TaalMala license for Android. How do I receive and install the license on my Android device? A. If you paid for TaalMala Android license from Google Play Store, the license is activated for your user ID automatically, provided that you purchased the license using the same ID which is used to sign into your Android device. After your purchase is successful, please wait for a few minutes, then exit TaalMala on your Android device by pressing "Back" button twice and restart the TaalMala app. Please ensure that you are connected to a reliable Internet connection while doing this. The license will get detected automatically. If you continue to see trial license after this, please go to Settings and click on the "License Refresh" button at the bottom of the screen and wait until the license gets detected. If you paid for TaalMala Android license via our web site, you will receive an email from TaalMala.com containing detailed instructions about how to install the app license on your Android device. Please wait at least 24 hours for the email to be received. Also check your email account's Junk/Spam folder to ensure that the emails from TaalMala.com are not getting filtered as Junk/Spam. For demonstration of how to copy the license file license.lic received from TaalMala.com, see this video. Q. Can I install and use TaalMala on more than one computer? A. If you purchased one license for TaalMala, you can install TaalMala on one computer at any time. Of course, you can purchase multiple licenses and install TaalMala software on multiple computers at the same time. Additional licenses (up to 5) are available from us at a discounted price. Please contact us for details. Q. Can I install and use mobile version of TaalMala on more than one tablet/phone I own? A. The license terms of Android version permit usage only on one tablet/phone at any time. If you have more than one Android device on which you would like to use TaalMala, please ensure that it is actively being used only on a single device at any given time. We reserve the right to revoke the license if multiple simultaneous devices using TaalMala are detected under the same account. Q. What are the minimum system requirements for running TaalMala on a PC? A. Windows Vista/7/8/10, 1 GB RAM, sound card, speakers. Q. What are the minimum system requirements for running TaalMala on my Android phone/tablet? A. Android 4.4 or above, 100 MB space on SD card, 1 GB RAM recommended. Recommended Android version is 5.0 (Android L) or above. Q. What are the minimum system requirements for running TaalMala on my iPhone/iPad/iPod touch? A. iOS 9.0 or above. We recommend iPhone 5 or higher and iPad 2 or higher. Q. If I buy Basic or Classic Edition of TaalMala on Android/iOS today, can I upgrade to Classic or Premium Edition later? Q. I purchased a TaalMala license one one platform (Android/Windows/iOS) in the past and I want to transfer the license to another platform now. Is this possible? A. No. If you purchased a TaalMala license on certain platform, you must use the license on the same platform. It is not possible to reuse the license from one platform to another (e.g. not possible to purchase license on Android and use it on your new iPhone or vice versa). You can use your license on new device of the same platform subject to our licensing policy (e.g. if you purchased a license on an Android device and you upgrade your Android device, you can transfer the license to your new Android device, subject to our licensing policy). Q. I already paid for the TaalMala software. When will I receive my installation instructions and license? A. If you completed your order via our web site, it takes us up to 24 hours to process your payment. Once your payment is confirmed, you will receive an email from us with step-by-step instructions on how to activate the license. Please check your email provider's Junk/Spam folder as the email from TaalMala.com sometimes gets filtered there. For mobile/tablet version, you can pay and instantly download and install the licensed edition of TaalMala on your mobile device from the Google Play Store or Apple App Store. Q. I live in India and wish to pay for TaalMala in Indian rupees. How can I do so? A. Please pay via our secure online payment gateway or contact us. Q. Do you provide installation CDs for Windows Desktop version of TaalMala software? A. Yes. We provide installation CDs to our customers for an additional charge ($9.95 for international customers and Rs. 200 for customers in India). To order TaalMala on CD, use the appropriate links on the "Buy Now" page and specify the installation CD option when completing the payment. If paying in Indian rupees, please add Rs. 200 to your payment amount or select the CD option while ordering. Q. I lost the original installation package for TaalMala and/or I lost my installation password/license key for my Windows TaalMala installation. Can you provide a substitute password/license key? Q. I wish to cancel my order. What is your refund policy? A. If you have any problems with the software, it is recommended that you contact our support by sending us an email. We will do our best to resolve your problem. If your problem is still not resolved, we will refund your order as long as we have not provided you a registration key or a license file for the software (Windows or Android). We cannot process a refund once we provide you with the registration key or license file. It is recommended that you download, install and try the trial edition of the software before ordering any of the licensed versions. If you purchased using Google Play Store or Apple App Store, you are bound by their store's refund policies. We will not be able to process that refund for you. Q. Why does TaalMala on Android need so many permissions to run? A. TaalMala app on Android needs certain permissions on your device to operate properly. On Android Lollipop (5.0) and lower, it shows a message such as below at the time of installation. Here is an explanation about why the app needs these permissions to install and run properly on your Android device. Permission to read/write to/from your SD card or internal storage: This permission is required so that TaalMala can read and write the compositions you create using Taal/Lehra/SwarMandal composer and sequener and some other temporary data files. Even if you do not have sequencer license, TaalMala allows you to create temporary compositions, which are stored on your SD card or internal storage. The app needs permissions to read and write these files from/to the SD card. 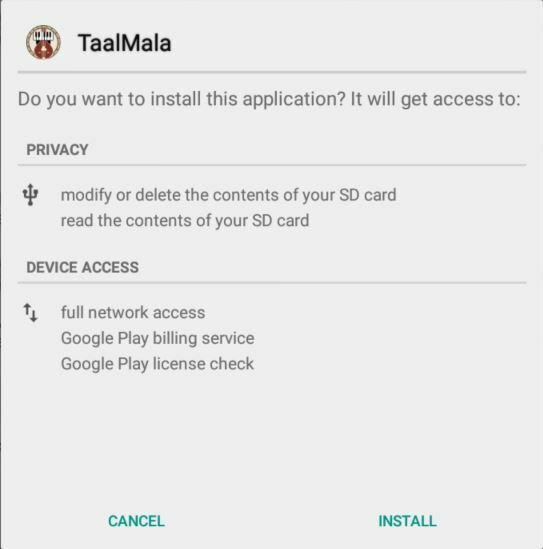 Sometimes installer on Android shows a warning message about these permissions in more explicit language, but please rest assured that TaalMala does not use the above-granted permission for any reasons other than those mentioned above. Full network access: This permission is needed to send crash logs to TaalMala.com when the app crashes. No information other than the logs generated by the application are sent. These logs help our engineering team to fix the problems and improve the app. Google Play billing service and Google Play license check: This permission is required so that the app can check with Google Play Store if you have licensed the app and if yes, which license you have purchased. Please note that although the standard Android message shows that the app needs access to "photos, media and files on your device", TaalMala does not access anything other than the temporary data files it creates or the compositions you create and save on the SD card of your device. The above message is a generic Android message. If you deny the above permission, the app cannot continue. These permissions are required for the same reasons mentioned above. If, for some reason, you denied these permissions with the checkbox "Never ask again" checked, the app may misbehave or may not start at all. In such a case, if you change your mind and wish to use TaalMala, go to your Android system settings - Apps - TaalMala - Permissions and grant all requested permissions there. Q. I recently changed my computer or Android device and tried to re-install TaalMala on the new computer. But the original license file provided to me does not work. Why? A. The license file provided to you is computer-dependent (for Windows) or device-dependent (for Android). This means the license file is unique for the computer/device for which it was generated. Please see our licensing policy for details. Q. How do I compose a Taal, Lehra or SwarMandal pattern using TaalMala? A. For help on Taal composition using Windows Edition of TaalMala, please refer to the Help page. For Taal, Lehra and SwarMandal pattern composition using Android or iOS editions of TaalMala, please refer to the Help page. You can also get the composer help by clicking the help button in Taal or Lehra or SwarMandal composer screen. Q. How do I get the pre-composed Taals for TaalMala? A. All Windows Editions of TaalMala (Trial, Basic, Classic and Professional) come with 201+ pre-composed Taals. When you install the software on your PC, these pre-composed Taal files are automatically copied to your computer and show up in the left panel of TaalMala Window on the PC. The Android and iOS Premium and Classic Editions of TaalMala come with 341+ pre-composed Taals and sequences pre-installed. The Android and iOS Basic Edition of TaalMala comes with 54 pre-composed Taals pre-installed. Additional Taal packs can be purchased from within the application. For more details about Taals included in various editions, please see this page. Q. How do I contact TaalMala.com? A. You can send an email to us. or complete this form. Q. Is TaalMala on iPhone/iPad available at a discounted price for customers in India? A. No. The price of Licensed Edition of TaalMala on iPhone/iPad is uniform worldwide. Q. Will I be charged any fees when paying for TaalMala using Paypal? A. We are not aware of any transaction fees or additional charges paypal.com charges to you if you pay for TaalMala software using their payment processing service. However, you should completely read the terms and conditions when you complete your transactions via paypal.com. Please note that Paypal is a third-party payment processing company, and is not associated with TaalMala.com. TaalMala.com simply uses their credit card payment processing services. If you have any unresolved issues with Paypal, we recommend that you contact their customer service directly. If they do not respond to you, you can write to us and we will try to contact them. However, we are not liable for any charges from Paypal except the TaalMala licensing fees that you may have paid to us via Paypal. Q. I have both Windows and Android versions of TaalMala. How do I play a Taal composed using my Windows version on my Android device? A. If you have Classic/Professional PC Edition of TaalMala and also Android Full Edition, you can export the Taals composed on your PC to your Android device. To do so, simply copy the Taal file (*.tal) to your Android device's .../TaalMala/Taals folder on its SD card and restart TaalMala (If this folder does not exist, you can create it). The Taals read from the external SD card are shown in a different color code inside TaalMala Taals list. Please see the Help page for more details. Q. How do I use my own or custom Tanpura sounds with TaalMala (Android only)? A. Starting with version 2.0, TaalMala on Android includes many built-in Tanpura patterns with default Tanpura sound samples recorded from a real Tanpura. However, for any reason, you would like to use your own Tanpura sounds with TaalMala, you can do so by following the steps below. Record your Tanpura sound. You can either record just plain Sa sound or record the entire Tanpura loop sound (all strings). If you record only Sa, ensure that the file is named as "sa.wav" or "sa.mp3" (case-sensitive), depending upon the format. TaalMala can accept any mp3 or WAV files up to 44.1 kHz sampling rate. If you record the entire Tanpura loop (all strings), you can name the recording anything. Copy all these sound files to a folder .../TaalMala/Tanpura/ on your Android device. If the folder does not exist, create it. If you copied file "sa.wav" or "sa.mp3" to this folder, then TaalMala will use the contents of this file as the base Sa for generating Tanpura patterns. If you want to revert to the built-in Tanpura sounds, simply rename or delete the file "sa.wav" or "sa.mp3" (as the case may be), and re-start TaalMala. Any other WAV or MP3 files in this folder (.../TaalMala/Tanpura/) will show up in the Tanpura patterns list on the TaalMala main screen. Note, however, that for these custom sounds to play properly, they must be under size-limit of 1 MB when uncompressed (PCM). Q. Play/Pause/Stop buttons in TaalMala application toolbar (Windows PC Edition) are grayed out. I can't start playing a Taal or I can't pause/stop the currently playing Taal. Why? A. Please click in the area which shows the main TaalMala composition (part of the Window which shows the Tabla picture and the TaalMala logo). Does the button become active now?